What happens when nutrition meets taste? It results in brown rice sprouted pulao. Try this eclectic and tasty mix today. Combining the 2 really good sources of fibre namely brown rice and mix bean sprouts, this is one tasty recipe that fits the health bill too! Sprouts bring not only health but also a rich mouthfeel to the pulao that you will simply love this pulao. Put oil in the pressure cooker. Heat it and then add cumin seeds, bay leaf, cinnamon and ginger garlic paste to it and heat them. Add green chillies, onions, mixed sprouts to it and mix them. Add turmeric powder, chilli powder, coriander powder, cumin powder and salt and mix them further. Now, add the soaked brown rice to it with required amount of water. 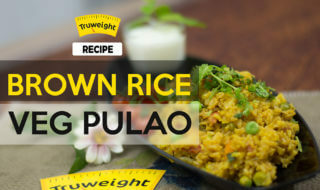 Cook well and you are ready with your brown rice sprouts pulao. Bon appetit!